Getting ready to celebrate a new baby, an anniversary or a 50th birthday? No matter what event you have coming up, you can make a statement with one of our colorful event and party banners. We customize quality vinyl banners using our state-of-the-art large format printer, and most orders ship next business day! Select a pre-designed template above and add your information. 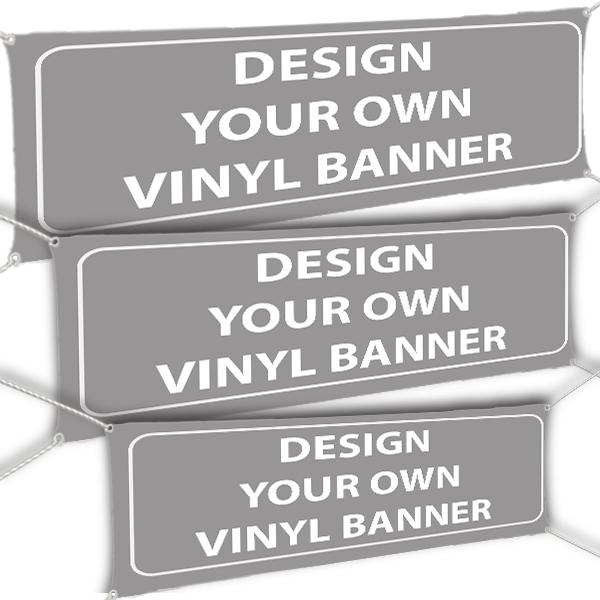 We can customize party banners with information including names, events, dates, contact information and more. Our templates include holiday, birthday, baby shower, family reunion, wedding anniversary and more. Our party banner templates are pre-designed and easy to personalize! Choose from the two most popular sizes we offer: 2' x 6' or 2' x 4'. You can also pick your size and design it yourself! Custom party banners and event banners can be used indoor or outdoor, and special features include optional wind slits, grommets and protective coating. Our custom full color printing is offered on an array of banners, also including advertising and custom storefront banners. If you are looking to draw customers to your business, check out our full supply of business promotion banners, or design your own banner.